Our salt ponds and mangrove wetlands are a complex ecosystem. Many kinds of plants and animals interact in harmony to keep St. Martin’s shores from eroding and preserve our clear waters and coral reefs. One tiny animal in particular plays a big role in holding it all together. The big claw can be used for protection. Fiddler crabs are small, a couple inches wide at most. On St. Martin, they are most common on the edges of our salt ponds, on sandy flats and beneath mangrove trees. 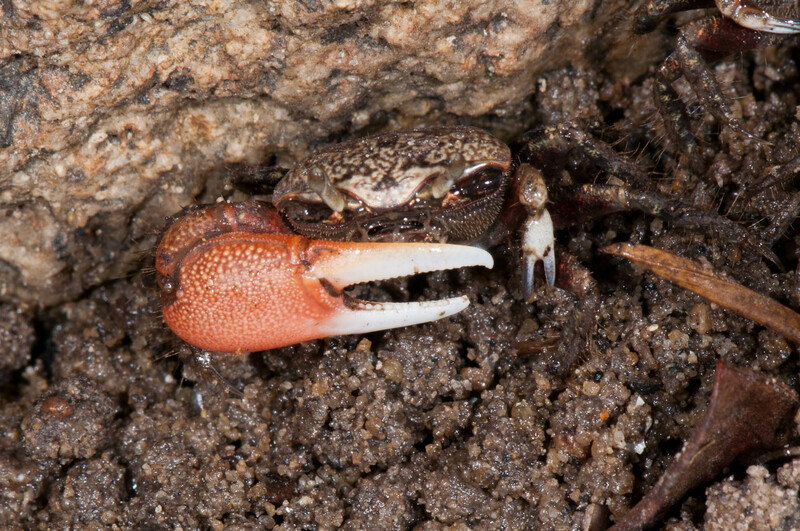 Male fiddler crabs are easy to recognize because they have one enormous claw, sometimes almost as big as the rest of their body. Why are these little crabs so important? Consider one role of our ponds and mangroves: they trap organic material and soil before it gets swept out to sea. This process counteracts erosion and also keeps the sea clean and clear, something that corals need to survive. Fiddler crabs help, bite by bite. They use their small claw to put sand in their mouth and filter out tiny bits of food from it. Fiddler crabs also help maintain healthy mangroves by digging tunnels in the sand. 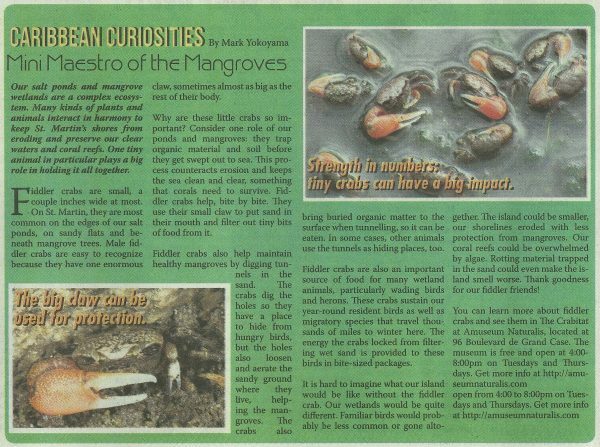 The crabs dig the holes so they have a place to hide from hungry birds, but the holes also loosen and aerate the sandy ground where they live, helping the mangroves. The crabs also bring buried organic matter to the surface when tunneling, so it can be eaten. In some cases, other animals use the tunnels as hiding places, too. Fiddler crabs are also an important source of food for many wetland animals, particularly wading birds and herons. These crabs sustain our year-round resident birds as well as migratory species that travel thousands of miles to winter here. The energy the crabs locked from filtering wet sand is provided to these birds in bite-sized packages. 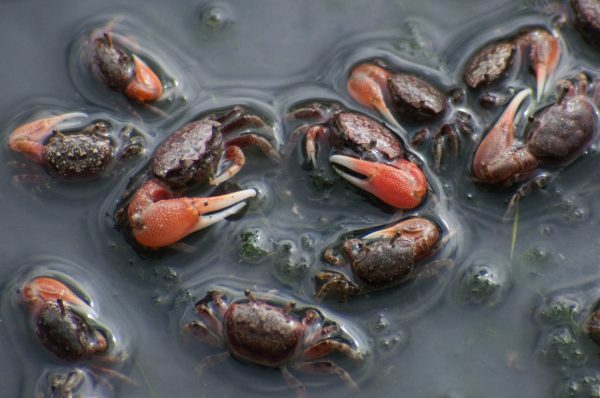 Strength in numbers: tiny crabs can have a big impact. It is hard to imagine what our island would be like without the fiddler crab. Our wetlands would be quite different. Familiar birds would probably be less common or gone altogether. 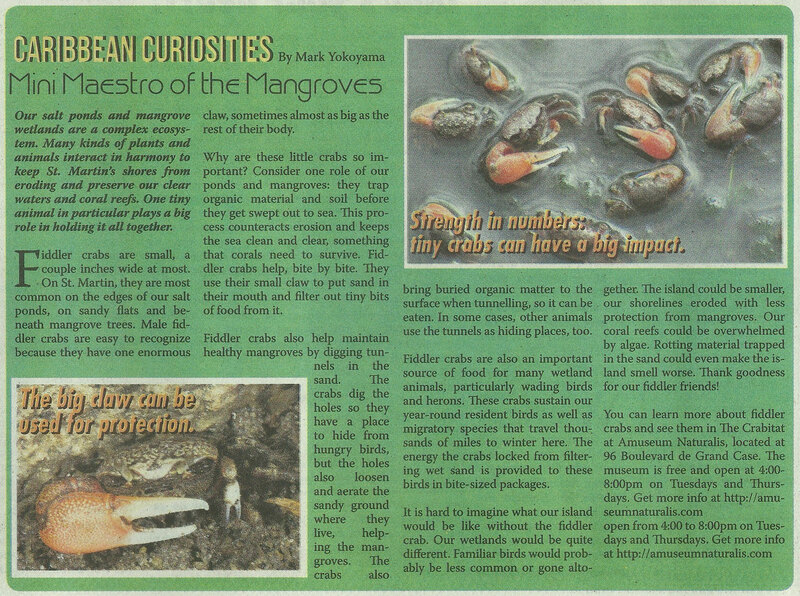 The island could be smaller, our shorelines eroded with less protection from mangroves. Our coral reefs could be overwhelmed by algae. Rotting material trapped in the sand could even make the island smell worse. Thank goodness for our fiddler friends! You can learn more about fiddler crabs and see them in The Crabitat at Amuseum Naturalis, located at 96 Boulevard de Grand Case. The museum is free and open 4-8pm on Tuesdays and Thursdays. Get more info at http://amuseumnaturalis.com.